Use this 3 joule energizer for long temporary and semi-permanent sheep, goat, poultry and wildlife-deterrent fences, long permanent cattle fences and medium-length permanent sheep and goat fences. Can be powered by either a 110v plug-in or 12v battery (sold separately under accessories below). Don't forget to order a Wiring Harness! This energizer does not include a Wiring Harness (sold below), which connects leads and clips to attach to the fence and ground rod. A 110v AC or 12v DC electric fence energizer used mostly to keep out deer, raccoons and rabbits from garden/orchard areas. It is also used to keep in poultry, cattle, sheep, goats, horses, and guard dogs. Effective at protecting against coyotes, stray dogs, bear and fox. 2.74 joules in moist soils. .45 joules in dry soils. Requires 9' of ground rod (To order, see accessories tab above.) in the ground. 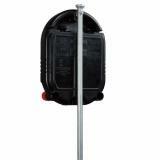 Comes with a 110v plug-in adapter with a 6' cord and a 12v battery adapter with 40" cord. Draws 4.5 watts per hour. Draw from a 12v battery is 210 milliampere (mA) per hour. With this energizer a 12v 100 ampere hour, deep cycle battery will last 12 days* on a clean or a weedy fence. *Assumes being drawn down to 40% between recharges. Can use a 20, 30, 40 or 50 watt solar panel. All distances are dependent on amount of grass/weed load on the fence. See options under accessories tab above. Versatile, can be used as a plug-in energizer or as a battery energizer. Adapts from one style to the other in a few seconds. Can be moved around easily. Low cost. 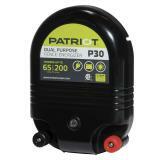 The Patriot P30 can be mounted either inside or outside of a building, but not where there is risk of fire. The energizer must be mounted vertically. Protect the energizer from direct rainfall. Connect an insulated cable (stripped back 1 - 2" on ends) to the fence terminal on energizer, run the cable to the fence line and connect, or use the positive part of the Wiring Harness. Then run a second length of cable from the ground terminal (with ends stripped again) on the energizer to the ground rod, or use the negative part of the Wiring Harness. Secure to ground rod(s) with a clamp. Plug into outlet and test fence. Attach wiring harness to Energizer. Attach the bare end of the wire with the red clip to the fence terminal of the energizer. Attach the red alligator clip to the fence. Attach the bare end of the wire with the black clip to the ground terminal of the energizer. Attach black alligator clip to the ground rod. Connect the energizer to the battery. Insert battery adapter into the Patriot unit. Attach red alligator clip from the adapter to the red “+” terminal of the battery. Attach black alligator clip from the adapter to the black “–” terminal of the battery. Unit indicator light should flash and a tic-tac sound will be heard. If the indicator light doesn't flash, then the unit should be serviced. Make sure the power is turned off before working on the fence or the energizer. Make sure the fence line is clear of grass and debris that may lower the fence’s voltage. Ensure the solar panel is facing due south and avoid placing the unit where it may be covered by shadows from trees, bushes or tall grass. Regularly remove all debris from the solar panel. Batteries that are less than 40% charged may become damaged. Batteries MUST remain fully charged in freezing conditions. When using a 12v deep cycle battery, there is no case to protect the battery, so the battery will be exposed to the elements and risk of theft. This unit is not modular, therefore it is not repairable. Never place your head or upper spine near an electrified wire. Accidental head or neck contact can occur when pushing a voltage probe into the soil. Be careful when doing so to avoid head-to-wire contact! Never attempt to step over or climb through an energized fence of any kind. Never encourage anyone to touch an electric fence. To check—first turn off the energizer. Then disconnect the wires going to the fence and ground rod system. Turn the energizer back on. Then measure the voltage on the energizer between the 2 terminals (fence and earth) with a Digital Fence Voltmeter or other fence testing device. Touch one end to “–” earth terminal and the other end to “+” fence terminal. If the tester reads under 4000v, the energizer (or possibly the battery if it’s a battery/solar energizer) is the problem. If the tester reads more than 4000 volts, the energizer is working properly and the fence is the problem. Most energizers put out between 5000v and 8000v when there is no load (i.e. no fence hooked up). Check that the 110v outlet is "live" by using a plug-in drill or test light. If the test light works and the energizer does not, call Premier. If it's a 12 volt energizer carry the unit to a nearby vehicle and attach the input cords carefully to the vehicle's battery. If the energizer now works, then your fencer's battery needs to be recharged or replaced. If the energizer does not work, then you should call Premier re. repairs. If the fence is at fault, then you must find the fault(s) and fix them. Here's how to start this process: If you have a Fault Finder you can simply touch the fence with the Fault Finder at various points along the electric fence(s). The Fault Finder will tell you at each point which direction to go in to locate the problem. Move in that direction testing as you go and you will arrive at the problem. Walk or drive along the fence looking for any point in which the energized wires touch the soil, a steel post or a steel wire. On HT wire fences, check the wires at braces to see if they are touching a hot wire. On netting, look for a hot wire touching the metal stake at the bottom of the plastic posts. Also look for damaged insulators. If the fence can be separated into several parts (by switches or by disconnecting parts of it), you can locate the problem by beginning at the far end and then progressively turn off or disconnect the sections of fence. When the voltage on the remaining fence rises sharply, you've located the section(s) that's causing the problems. The alternative to (2.) is to begin at the fencer and progressively turn on sections of the fence. When the voltage suddenly drops you can assume that the problem is in the section most recently connected. 2-year warranty for energizers and solar panels cover lightning damage and defective parts or workmanship. Should an energizer fail, we will replace the unit, bill you for the cost to do so, then reimburse you for warranted expenses after we have examined the failed unit. Misuse and flood damage are not covered. Attach to Patriot electric fence energizers to run off of AC power. Attaches to Patriot energizers for battery power. Use 12v, deep cycle batteries for best performance and longevity. Holds solar panels of nearly any size (10 to 70 watts) at 45˚ (for maximum solar response in most conditions) on top of the energizer/battery support box. Quality photovoltaic solar panels ranging from 10 watt to 70 watt capacity with an output of 15 to 21 volts in full sunlight. Use this handy support box for easy movement of your energizer, battery and solar panel. 3 in 1 tester for fence voltage, intensity of current and fault finder. For connecting a battery energizer to the fence and ground rod. Can also be used with a 110v energizer if within close proximity to the fence and ground. It arrived and it does only have one mounting hole, but I happened to have a really long zip tie about 3 feet long. I mounted it on a pole in the barn and zip tied it to the pole. The goats said it works great and the few weeds that have touched the bottom wire are crispy. Its always hard to rate something like this, other than the fact that it arrived, plugged it in and it works. I will say I wish that it had more than one mounting place, we are mounting it to a stand with a solar panel and with it being light weight plastic, if it were to break you wouldn't have any other way to mount it. At this point that is my biggest concern. Otherwise it seems to work great.